So, while I may have missed out on Black Friday, Small Business Saturday and Cyber Monday, there's a once-in-a-lifetime occasion I refuse to let pass me by: Thanksgivukkah! Fortunately, we've still got a couple of nights left to celebrate the blessed festival of lights and leftover turkey. 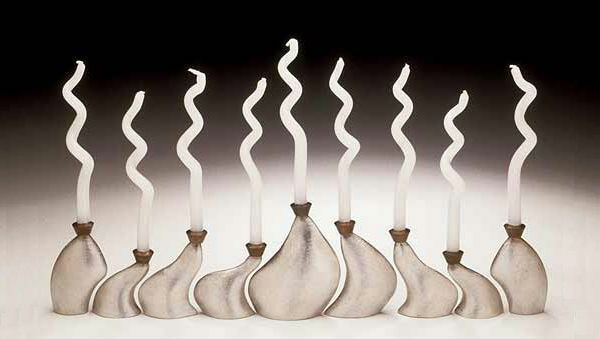 I've found many gorgeous modern menorahs in the past, but this Meta Menorah by artist Lisa Slovis caught my eye for its organic shapes that seem to flow like mercury. The nine pewter and bronze pieces can be arranged and rearranged to create a different configuration for each night of Hanukkah, and those perfectly curly candles are included.